After a slight delay on my train from Cheltenham Spa to Bath, I arrived mid-afternoon, but was at my hotel in Henrietta Street a little over 5 minutes later by taxi. I immediately recognised street names from Georgette Heyer and Jane Austen's books; Laura Place and Great Pultney Street...Tall many storied houses lined each side of the road in uniform precision, but gently curving into the distance. My visit coincided with the UK-wide Museums at Night festival, so I had plenty of options for entertainment that evening. I chose the talk by writer Lindsey Davis in The Pump Room (her books have been about a Roman Detective- Falco. The first book, 'The Silver Pigs' has been on BBC radio many times). The audience, of about 40, learnt about Lindsey's early career in the civil service, her first novel attempt- a civil war romance-that didn't win the Georgette Heyer historical novel competition, but did get sold to Woman's Realm (a magazine no longer in existence). We were read an extract from her new Albia book, and heard about her stand-alone on the Emperor Domitian, that was written between the Falco and Albia series. At the Q&A, I asked Lindsey if she plotted or wrote as she went along? (She'd already said she kept firm control of her characters.) Her reply surprised me a little- "If I plotted I would never get a book written." The entry charge to the talk also allowed me to go around the Roman Baths museum afterwards- they were staying open later than usual. There was music everywhere, inside the museum a man playing a lyre type instrument- a mini harp almost, and a little further on from him, a group with a device that had a simple keyboard, small hand pumped bellows, creating notes by metal tubes in water...I can't play a note but got a reasonable sound out of it! The rooms off the main pool showed the structure and design of the steam room, warm room and so on; and there were projected images on the wall of semi-naked men in the cold water pool area. Outside, around the big pool - that you see in photos- there was a small bar, and a trio (singer, double bass and guitar) providing entertainment- they were very good; while people sat on benches in alcoves, or at the edge of the pool, enjoying the warm evening air, and the torches burned brighter as the evening sky dimmed. Usually visitors only get to experience the pool in the evening in June and July, so it was a fantastic bonus. It sounds wonderful - your enthusiasm shines through! I now need to get back to writing and editing. What a fantastic time you must have had - very envious! I completely agree with that view about plotting and never getting the book written - that's how I feel and why I'm a pantster! It was fantastic to have 2 whole days to myself in Bath, Rosemary. Glad you enjoyed it. 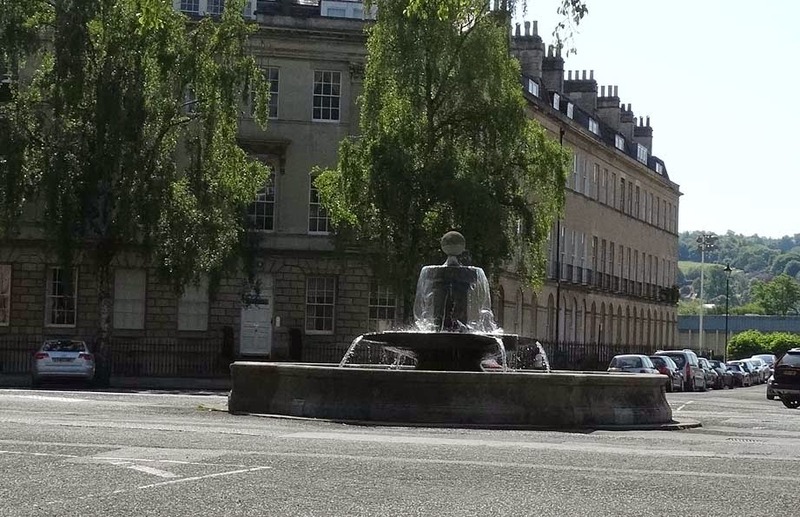 I'd like to go back to Bath, I've not been since I visited on a Girl Guide trip. That was several years ago! As I was there before the school holidays, it was still busy, but not the crush you get in the summer months. There was a large party of Brownies going round the museum, Friday night. It took the leaders time to round them all up toward closing time. Changes for the Romance Market?